Are you looking to track your weight on a regular basis? If so, an accurate bathroom scale is a must-have for you. Today’s bathroom scales often do more than just indicating your weight. Some have advanced options for determining the percentage of your weight that results from fat. Others can also calculate your body mass index/BMI – which measures the relationship between your weight and height. Modern scales also come with an option of uploading your information to a computer or a smartphone, enabling you to track the changes in your body measurements over time. 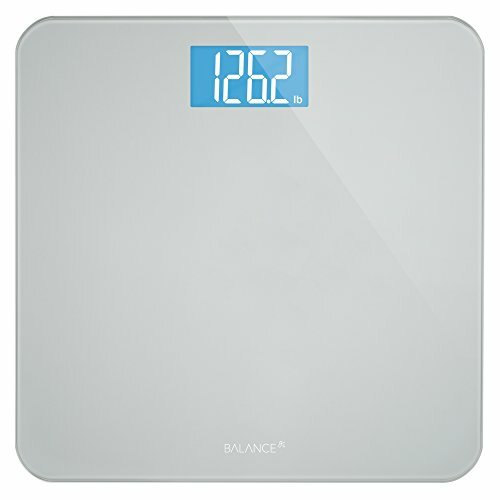 There are hundreds of bathroom scales available in varying shapes and sizes. This makes it daunting to find the best bathroom scale for your needs. 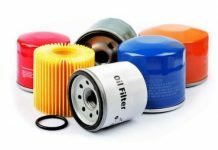 To aid you make the right selection, outlined below is a guide with the main factors to consider when searching for these products. Does a Body Fat Scale Really Work? Bathroom scales are available in a myriad of types. 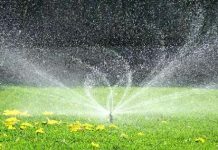 Consider the following key factors when looking to purchase one. 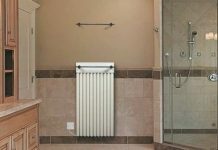 Despite the various bathroom scale shapes and size, they broadly fit into three broad types. They include traditional mechanical scales, electronic or digital and body fat analyzer scales. Making a decision on the best type of bathroom scale for your needs often comes down to how much you want to know about your weight and body. Besides measuring your weight, body fat scales are designed to display the percentage of your body fat, thus helping you to differentiate between fat loss and weight loss. Aside from this, some also provide further readings including bone density, BMI, and body water percentage. For accurate measurements, you will need to enter some vital statistics such as height and gender. These scales simply measure body fat. They send a small electric current around your body, which moves slowly through fat and muscles quicker. This speed enables the scale to calculate your body fat and muscle density as percentages. Note that this scale uses electric current. Therefore, you should not use it if you have a pacemaker or internal medical devices or pregnant. They are also not indicated for children under the age of 10. You will have to spend anything around $15 to $200 for body analyzer scales. However, expensive models offer full packages regarding the number of measurements it gives such as muscle mass, total body water percentage, and visceral fat content. 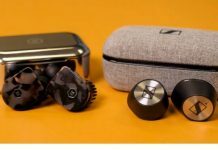 Smart body fat analyzers, which connects to your smartphone or tablet could cost a little more. Digital bathroom scales, like mechanical scales, come in different styles but are designed to measure your weight. They differ from mechanical scales in their display, as your weight is displayed on an electronic screen in imperial or metric measurements. Some digital scales have extra features such as user memory, which allows several people to store their data among other features. The scales are designed to recognize users and monitor the difference in weight between various people. Typical prices for these scales range between $10 and $50, with the price variance based on the extra features of the scale. Mechanical bathroom scales only do the simple job of measuring your weight with no extra bells or whistles. Their display typically shows your weight in imperial and metric measurements at the same time. Mechanical scales cost between $5 and $40, with price variance based on the strength of materials. Bathroom scales are basically designed for home use. Therefore, they should have weight capacities ranging between 300 and 550 pounds. 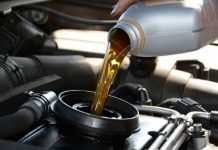 Newer models typically have higher weight capacities, ranging from 350 and 450 pounds. Measurement increments offer accurate readings. Therefore, a scale with small measurement increments increases the overall accuracy of your readings. Better scales often have increments of at least 0.2 pounds. Other intriguing features you should keep in mind when searching for bathroom scales include several mode options, multi-user memory capacity, large display, and a suitably sized platform. The following video shows you how a bathroom scale works. Using the guidelines outlined above, consider one of the following top 10 best bathroom scales. If you are looking to drop some inches as well as pounds, the EatSmart Precision Digital Bathroom Scale is the perfect bathroom scale to consider using. This simple, glass-top scale comes with a waist tape measure that provides for users to measure their waistline changes in relation to their weight. This scale comes with an increased capacity of 400 pounds and a great precision and repeatability. This makes it an ideal product for tracking your weight loss easily and quickly. Using this scale is quite simple. You only need to step on the scale and watch for the accurate readings in seconds. Readings are given to the nearest 0.2 pounds in EatSmart’s 3.5” LCD. You’ll be fascinated by this scale’s proprietary new step-on technology, which eliminates the need for tapping to turn on the scale. This scale’s display is the other interesting thing to note. It contains a cool blue backlight, which makes it easy to view even in dim light bathroom situations. EatSmart is not only easy to use but also known for its industry-leading design and accuracy. This scale is extremely accurate and engineered with the highest precision standards. 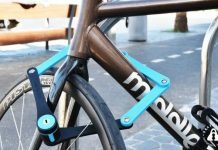 It features four gauge sensors, which ensure that you get accurate measurements down to the nearest 0.2lbs. 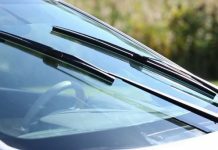 Besides, its slim tempered glass fits perfectly to any surrounding and the largely non-slip surface ascertains safety when using it. Staying fit and healthy has been made easy with the Etekcity Digital Body Weight Bathroom Scale. It is an auto-calibrated scale, which requires you to simply step on its large tempered glass for immediate results. 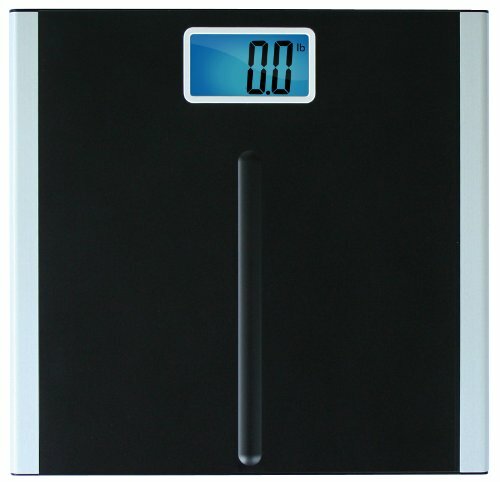 It is an advanced digital scale model, which provides a convenient step and read system. Like other scales of this caliber, it features sophisticated sensors, which ensure that your results have a margin of 0.2lbs. This ascertains an accurate weight measurement every time. The scales weight capacity is 400lbs, with wide application range and units in either lb. or kgs. 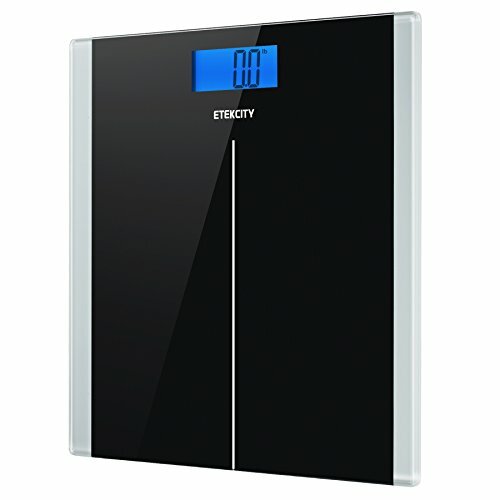 The Etekcity Digital Body Weight Bathroom Scale is multi-functional with an auto-power off, auto zero, low battery and overload indication. 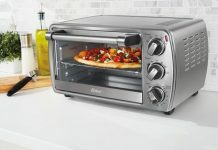 It also features an easy to read and backlit LCD display. Additionally, the 6mm thick tempered glass surface provides the much-needed safety and comfort. 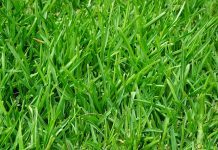 It provides exceptional sturdiness. Always lay the scale on a hard and flat surface for best accuracy. Body weight naturally fluctuates throughout the day. People are lighter during the morning and evenings and heavier in the middle of the day. Measuring your body weight may not necessarily help you much if you want to lose weight and get back to an enviable shape. Therefore, you will need to find a scale that depicts how much of your weight includes body fat, besides tweaking some exercises and diet to ensure that you lose fat and not muscle mass. 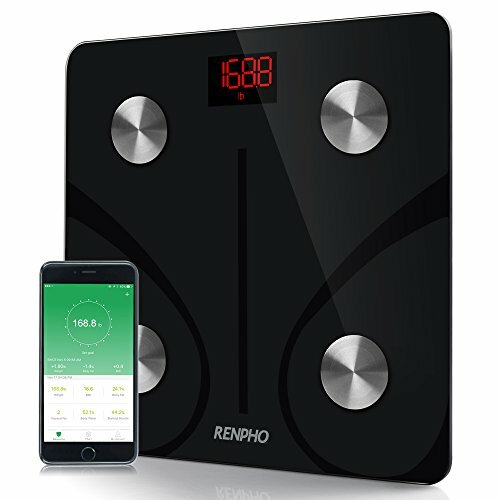 One of the bathroom scales available on the market that will help you achieve this goal is the RENPHO Bluetooth Body Fat Scale. It is a smart scale that boasts of a sleek and stylish exterior, perfect for complementing your bedroom or bathroom interior decor. Its surface is made of a 6mm tempered glass finish with ABS plastic to ascertain durability. The scale also features four high precision sensors and four electrodes that help you get the most accurate body measurements. The catch with this is that you should ensure that you apply pressure to all sensors when you step on the scale to get accurate readings. Additionally, the scale works on BIA or Bio-Electrical Impedance Analysis technology which helps in monitoring nine various body compositions including water, bone mass, body weight, basal metabolism, skeletal muscle, BMI, body fat, and age. 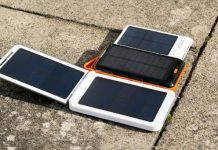 Perhaps the most notable feature of this scale is the 4.0 Bluetooth connectivity that allows you to connect your smartphone seamlessly using the Renpho app. The App can easily be downloaded from Apple store or Google Play. 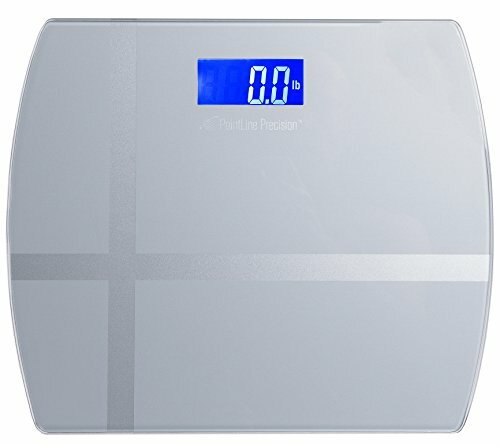 If you are looking for a bathroom scale that simplifies your daily weigh-ins helping you to focus on your fitness goal, consider the Greater Goods Backlit Digital Bathroom Scale. 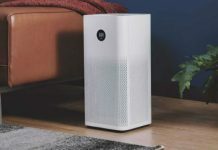 It comes with a sleek-tempered glass and a minimal look that blends to any space and an easy to read screen, providing only the information you need. The Greater Goods Backlit Digital Bathroom Scale is extra-large with a backlit LCD screen. The scale automatically calibrates itself. All you need to do is to step on the weight, and the scale will automatically turn on, and off when finished. 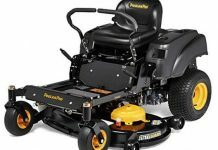 It is also non-slip and scratch resistant ascertaining some durability with the scale, regardless of the nature of your bathroom floor. Like other scales of this caliber, it comes with four weighing sensors, which work together for a 0.2lb weight accuracy. The large and tempered glass on the weighing platform provides up to 400lbs of support with a minimum weight of 11lbs. The Innotech Digital Bathroom Scale is a strong, smart and beautiful bathroom scale that isn’t one of those pretty but fake scale faces you could be used to. 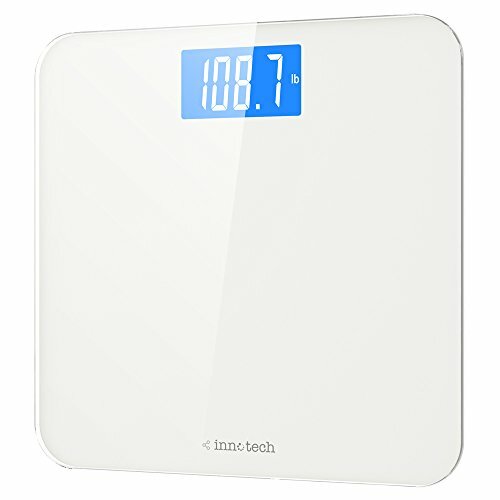 The sleek scale comes with an elegant design and a sturdy tempered glass, combined with perhaps the most advanced German technology for a not only beautiful but also accurate bathroom scale. Obviously, more weighing sensors translates to an incredible weight measuring accuracy. This is what Innotech truly depicts. 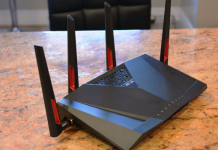 The four sensors ascertain an error-free reading, with a 0.2lbs margin of error. For accommodative purposes, the scale weighs up to 400lbs. 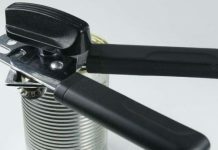 It also comes with an overload indicator, which prevents overload and possible damage on your scale. The main challenge with scales often comes down to assembly. However, thanks to Innotech you won’t have to go through this process. Innotech scales need no assembly and are ready to work as soon as you take them out of the box. The scale also features advanced German automated technology, which provides reliable readings day in and day out. Get more information about this product through this video. 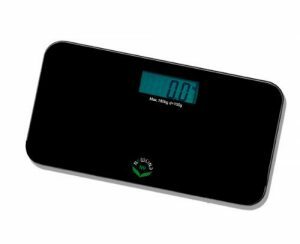 If you are looking for a digital bathroom scale for precise and accurate keeping track of your weight and easy to read with backlit display, look no more. The IDOO Precision Ultra Wide Bathroom Scale is a low profile, sturdy and durable construction with a sleek and sophisticated design that makes it look good in any bathroom. The scale’s unique and elegant design automatically stands out. Being a heavy-duty bathroom scale, it is made in white marble design ascertaining its elegance and beauty. 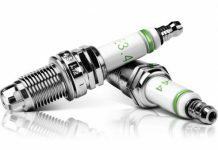 High accuracy is provided by the four high precision strain gauge sensor system, which provides for not only consistent but also accurate measurements up to 440 pounds. The units of measure can be switched between kg/lb/st. You’ll certainly like the large display provided by the 4.3” LCD display and a cool blue backlight. It also comes with extra-large font numbers, which makes it easy your measurements from any distance, even in dark environments. The scale is durable and sturdy with a steady platform. It gives the best stability besides being extra wide. 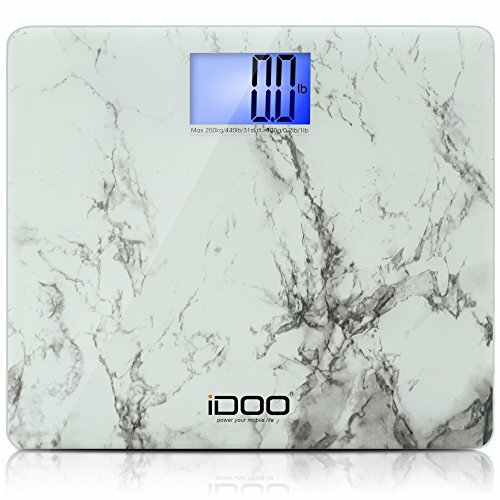 The IDOO Precision Ultra Wide Bathroom Scale features a fast read and auto-calibrate technology, which provides immediate readings as soon as you step on the scale. The auto-calibrated scale automatically turns off thus allowing for a longer battery life. The scale runs on 3 AAA batteries which are included. The EatSmart Precision Premium Bathroom Scale represents another highly rated EatSmart bathroom scale. The scale features one of the highest max capacity scale with an extra-wide platform. To sum it up, it is a scale that can handle just a little more. Handling a little more calls for a scale that has an extra weight capacity. That said, the EatSmart Precision Premium Bathroom Scale can support up to 440 pounds, equivalent to 200 kilograms with weight increments of 0.2 pounds for extra accuracy. As mentioned, this scale has a wide platform. Whereas most of the scales in this price range are of 12 inches or less, the Precision Plus boats of a massive 15-inch wide platform, ideal for large individuals. 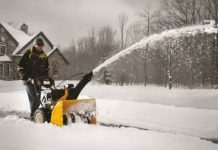 It is also has a non-slip base, which guarantees a firm footing. The step-on technology is yet another intriguing feature of this bathroom scale. With this, you simply step on the scale, and it immediately weighs you. 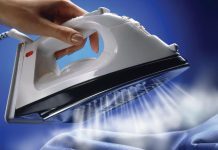 It is also easy to use, thanks to the auto-calibration feature, which automatically powers off the system. The scale requires 2 AAA batteries which are included during purchase. Reading your weight measurements won’t be challenging. 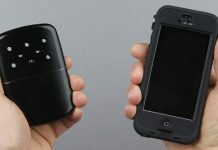 The measurements are displayed on a giant 4.3-inch LCD with backlight, designed to make it easy to read from any angle. Rounding up the scale’s effectiveness is the four high precision G sensors, which make this scale one of the most accurate bathroom scales you can find. Modern bathroom scales come with new features that could only be anticipated by previous models. The NewLineNY SBB0718M – NYBK Bathroom Scale is a 2011 design, featuring a lightweight and cool design. It is perhaps the best way to monitor your weight when traveling. The small size – 12.2” x 6.3” x 0.8” – of this bathroom scale doesn’t compromise on its weighting function and accuracy levels. Unlike other scales that may not favor toddler use, the NewLineNY SBB0718M – NYBK Bathroom Scale is perfect for toddlers, teens, and adults. It also features the latest step-on technology, which, as you know, eliminates the need for tapping the scale on when you need to use it. You will simply step on the scale and get a reading. To save on battery life, the scale has an automatic shut-off feature that shuts the scale off after 5 seconds. Ease of use and reading your weight measurements should not be something to worry with this scale. 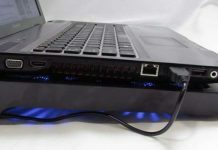 It provides a wide platform and a large LCD display. Overally, this is a great scale addition fits any home décor. 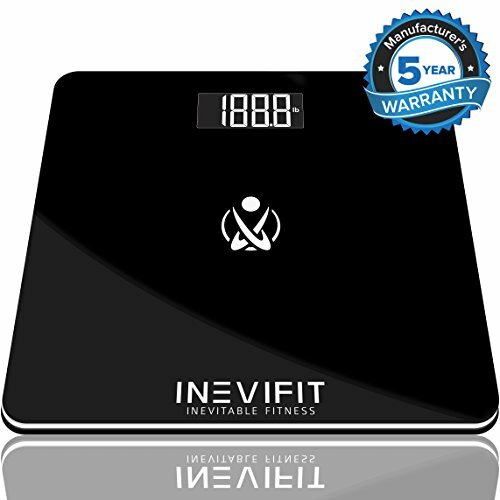 Meeting your fitness goals faster can be encouraged by having INEVIFIT Bathroom Scale for accurate daily body weight measurements. Surely, getting and staying fit has never been easier. However, this scale makes it easy to track your fitness progress with weight measurements displayed in seconds. Such information is perhaps exactly what you need to reach your fitness goals faster and keep you motivated. The scale’s black design makes it a perfect choice for every bathroom. It features a backlit LCD display that makes it easy to read the measurements. 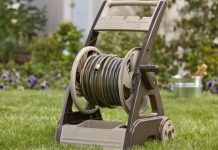 Its scale is also quite robust and can weigh up to 180 kg. Compared to other scales of this price range, this scale is notably better equipped. It provides avenues for monitoring all essential areas of the body. 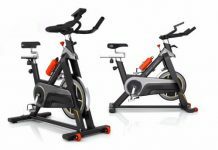 It also comes with advanced features such as bone mass reading – indicates how healthy your bones are – as well as calculates your body metabolic rate. This scale is presumed the best for multiple users. It is a good tool for up to 10 users as it can individually recognize and memorize their weight and characteristics. The auto on and off function saves on battery life as well. Weight monitoring strategies require that you stop guessing your weight. The AccuPoint Precision Digital Bathroom Scale claims to have the best precision system for measuring your weight in the market today. This system uses the latest German technology to ensure that it captures your weight correctly every time. The scale comes with a heavy-duty tempered glass of 8mm. The glass, besides being thick enough, is wide and spacious that it accommodates up to 396 pounds of weight capacity. It shows weight increments of 2 ounces, for extra precision. The non-skid pads ensure safety on the platform. The AccuPoint Precision Digital Bathroom Scale uses three AAA batteries, which often come included in the delivery package. Other extra stuff includes a bonus e-book which discusses on how body imbalances trigger weight gain. Bathroom scales come in handy when weight control can’t be avoided. In such cases, accuracy and reliability should be your priority concern. This is why you it is prudent to invest more in finding a best bathroom scale that delivers accuracy and reliability, without compromising on its effectiveness. Once armed with a bathroom scale, how often and when is the best time to weight yourself? For this, options vary. Popular studies suggest doing it once a week. However, new studies suggest that weighing often makes sense if you are on the path of loosing weight. I agree the term whether looking for losing weight or gaining the weight bathroom scale helps to track the results. Accuracy is must important while buying bathroom scales. I am searching bathroom scales on consumer reports and plenty of other sites. 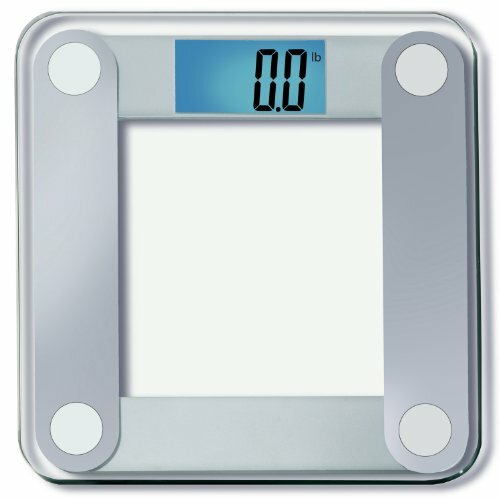 After spending hours of research I found one bathroom scale which is unique and advanced mentioned on the list which is https://www.amazon.com/Etekcity-Digital-Bathroom-Technology-Included/dp/B00F3J9G1W. I think this is the one of the best bathroom scale I ever seen. Is there anybody agree my point?